Antique 1800s Glazed Porcelain China Head Dollhouse Doll. 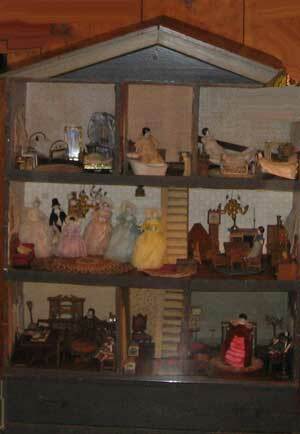 This is one of the smallest of the Collection of Antique dollhouse dolls. A very tiny, approx. 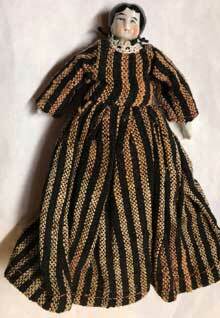 4 inches tall, really charming, black haired Antique china-head dollhouse doll in great condition. A china head on shoulderplate with bisque lower legs and arms, cloth body. She has rosy cheeks with a beauty spot on her right cheek and a rosebud mouth, wearing an outfit of layered sheer black lace over an ecru underdress and half-slip attached, with short sleeves. Pantaloons peek out from under the hemline. Her black ankle boots are painted on and there are no chips to her delicate hands. 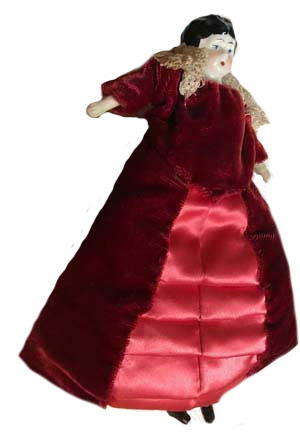 Email Elfie (elfie@dollsville.com) for details of all the Vintage Dollhouse Dolls, Dollhouses and Furniture Collections that will be online soon.